Lately I’ve started getting questions from the online forum Quora in my inbox. Maybe because I’ve answered a question or two, they think they’ve found a new source. Mostly I ignore these questions, because who has time. But recently, I answered the question, How can I have multiple scatter plots and one trendline for all of them combined in Excel. Then I decided it was worth turning my answer into a blog post, Add One Trendline for Multiple Series. A few of the questions have been interesting. I thought I’d share them here and see how you readers might answer them. You can answer in the comments, or if you’re ambitious, you can click on the questions and answer them in Quora. What is the most random thing you’ve created an Excel spreadsheet to track? I have tracked a lot of random stuff in Excel worksheets, and I don’t think I can even remember the most random things. I’ve been tracking my weight almost every day since mid-2006. I’ve been tracking traffic to my blog and sales of my software products for nearly as long. I guess website statistics, business performance, and even personal health metrics aren’t very unusual. What random things do you track in Excel? Is it true that about 4,000 features of Microsoft Excel are never used? What I’ve heard is that everyone only uses 10% of the features. But the 10% I use probably overlaps with only half of the 10% you use. Of course some features are used by everyone, and some are used by hardly anyone. But I doubt there are very many features that nobody uses. Nowadays, Microsoft wouldn’t even consider designing a new feature that users weren’t already clamoring for. Why do employers care if you’re proficient in MS products (word, excel, etc)? Are you serious? Employers want to know if you can already work with these important tools. If you can’t, why not, and how long will it take to get you up to speed? Can I install Microsoft office to a flash drive on my PC? That’s actually an interesting question. I guess the motivation is that you can install on a flash drive, then carry the flash drive around with you and use Office on any computer you plug it into. Of course, the program files go in one place, and all the registry information goes another. Never mind that it’s becoming harder with Office 365 to install Office into a custom path. And I suspect there is a check that the installation path is on a hard drive and not some removable medium. 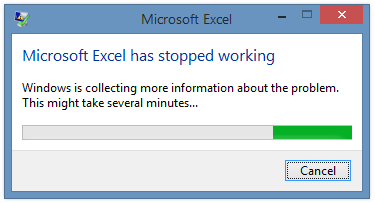 What do you hate the most about Microsoft Excel? I’m sure everyone has their own answer to this one: what’s yours? Posted: Thursday, December 13th, 2018 under General. When selecting cells and areas in an Excel worksheet, you can select one cell or area with the mouse, then hold the Ctrl key while selecting another cell or area, and the new selection is added to the previous selection. You can select multiple areas at once using this Ctrl+Select sequence. This is great, until you select one or more cells you didn’t mean to select, or if you just want to deselect something you’ve selected. In Excel worksheets, you can’t use the Ctrl key to unselect something that you’ve selected previously. This is a pain, because you have to start again with your multiple region selection, and hope you don’t mess it up again. This has been the behavior since Excel 1950 for Univac was introduced. In every other application I can think of, when you are selecting objects, you can use Ctrl+Select to add to the collection of selected objects. And if you Ctrl+click on a selected object, it is deselected. This works on objects in PowerPoint, shapes embedded in Word, files and folders displayed in Windows Explorer. People have grumbled about the inability to deselect a cell in Excel for a long time, and it even has received an entry in Excel UserVoice: Unselecting cells when using Ctrl to select multiple cells. Well, the Excel Team was listening, and not long ago they announced that it is possible to Deselect a selection in Excel. According to that announcement, it’s still only available to Insiders, who risk all to get the latest builds with the latest and greatest new features and the occasional “Gotcha!” Read about Office Insiders and What is Office Insider? on the Microsoft Office web site. I knew that this suggestion had been made in UserVoice, and I might even have heard that Microsoft was working on it. So one day, when I was tooling away as usual, I incorrectly selected some cells, and thought to myself, “When will they ever let me Ctrl+Select to unselect that stupid cell over there?” And I Ctrl+Selected that stupid cell over there, and it was UNSELECTED! Naturally I didn’t really believe it, so I Ctrl+Selected and Ctrl+Deselected that cell about twelve times. It’s such a seemingly small change, but it removes a frequent and annoying source of frustration. Suppose I have a range of data like that below left, and for some reason I want to select the header row and the rows with even X values. 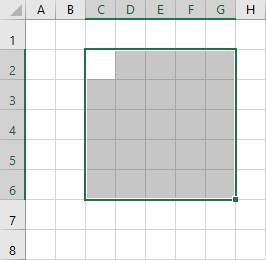 I start by selecting the header row and the row with X = 0. Now I hold Ctrl and select the row with X = 2 (below left). That’s how Ctrl+Select works. Then I hold Ctrl and select the row with X = 4, except I’m clumsy and also select the row with X = 5 (below right). Ordinarily I would just curse at my poor mouse-eye coordination, and go back to the first selection above. But now I can curse, then hold Ctrl and select the row with X = 5. Or rather, DESELECT the row with X = 5 (below left); the resulting selection is shown below right. That’s how Ctrl+Deselect works. Now I can Ctrl+Select the row with X = 6 (below left), and do what I want with the selected range, which apparently was shading the cells light gold (below right). So I was playing around to suss out the behavior more fully, and I present a few more examples. They all start with a simple rectangular range selected, C2:G6. Below left, I’m holding Ctrl while selecting part of the previously selected range, C4:E6. The resulting selection is comprised of the two rectangular areas C2:G3 and F4:G6. So I learned if the cell you click at the beginning of a Ctrl+Select operation is selected, you will deselect any cells in the range you are currently selecting. I selected B3:F7, starting within the previously selected range at cell F3 (shown below left), so all cells in B3:F7 end up not selected (below right). If the cell you click at the beginning of a Ctrl+Select operation is not selected, you will select all cells in the range you are currently selecting, and no cells become deselected. I selected B3:F7, starting outside the previously selected range at cell B3 (shown below left), so all cells in B3:F7 end up selected, overlapping the original selection of C2:G6 (below right). 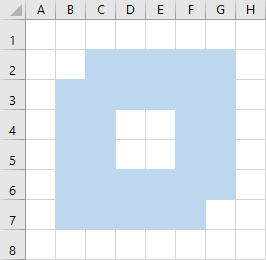 If I then Ctrl+Select D4:E5, which is completely enclosed by the previous selection, that small square region is excised from the selection. The new selection is easier to see if I then shade the selected cells below. Finally, it’s impossible to unselect all cells on the active sheet. Well, you can, if you select an object on the sheet, such as a shape, a picture, or a chart. But an active worksheet has an active cell. Below left, C2:G6 was selected, and I am Ctrl+Selecting the same range, from the bottom left corner to the top right. The new active cell is C6, the first cell of my last Ctrl+Select. This is the third UserVoice success story I’ve written about, joining Plot Blank Cells and #N/A in Excel Charts and User Voice Fixes Pivot Table Default Settings. There have been several other UserVoice suggestions implemented by the Excel team, as well as numerous being planned and under review. UserVoice is a great way to make suggestions about issues or new features in Excel. Don’t just start by making a suggestion, though. Search for your idea, and if it’s already there, vote for it and add a comment. Ideas are grouped by platform (Windows, Mac, Online, etc.) and by topic (Charting, Formatting, Pivot Tables, etc.). Among other criteria, when evaluating user feedback, the team looks for ideas with lots of votes. Posted: Monday, February 12th, 2018 under Data Techniques, General. This survey is being conducted by the Microsoft Excel team. In the future, new charting features will be added to Excel. We want to better understand how you expect charts, that have new features, to be displayed and behave in older versions of Excel that don’t have these new features. This survey will take approximately 10 minutes. Feedback from this survey will be used to improve the user experience in Excel. Responses to this survey will not be associated with any personal information. Please see the Microsoft Privacy Statement for further privacy details on all Microsoft products. Posted: Wednesday, September 7th, 2016 under General. Hello patient followers. I haven’t posted for a while, not because I can’t think of anything to write about, but because I’ve been rather busy. I’ll talk about each of these things separately, but I think I need a quick post to say what’s going on. There are plenty of topics that I want to cover. New chart types in Excel 2016. Charting and programming examples. Dozens and dozens of old articles that were written for Excel 97 and need to be updated. An article that I started in October and still haven’t gotten around to finishing is an Excel-based solution to xkcd’s velociraptor problem, inspired by an article in Wired magazine. I have a formula-based approach and a VBA approach, plus plenty of cool images from a Google search. I’ve written about how Microsoft has released Excel 2016 for Mac and Excel 2016 for Windows. The Mac version finally looks enough like the Windows version that I don’t feel totally hobbled while using it. In fact, the look and feel is very much like the Windows equivalent. Of course, it was released prematurely, and a lot of things were not really working yet, particularly on the VBA side. But each month Microsoft releases an update (the latest is 15.17), which fixes a bunch of stuff, hasn’t yet fixed a bunch of other stuff, and into which a few new bugs have crept in. The latest big improvements are that the ribbon can now be customized by add-ins like my own charting utilities, though there is not yet a capability for users to modify the ribbon themselves. The Windows version is pretty good; I’m using it most of the time now, except for testing. There are a few things I don’t like, for example the way they handle pinned files and folders in the File-Open and File-Save functions. But all in all, it’s working well. The Windows version has monthly updates too, if you’re using an Office 365 subscription. The coolest thing Microsoft has done is started up a User Voice section on Excel, which allows us, as regular users, to make suggestions for features that would make Excel even better. If you see an idea you like, you can vote on it, and the items with the most votes get attention from Microsoft. Here are some suggestions I’ve made, voted for, or commented on. Give us a proper NULL() worksheet function – This would let you use NULL() in a formula, for example, and a chart would treat the formula as if the cell were totally blank, and leave a gap in the line. You know what’s cool? Within a couple weeks of posting this idea, someone from Microsoft called me to discuss this function, and now it’s actually being implemented. Recent Files pane in Excel 2013 was pretty good, but Excel 2016 broke it – This is about how Excel 2016 messed up how pinned files and folders are displayed, which I complained about above. It’s only got 61 votes, so follow the link and add your vote. 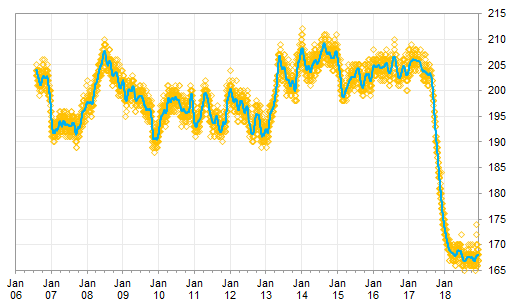 Sensible date formatting on X-axis of XY-scatter charts – This would give you a nicer date format for XY charts, without having to use the less-flexible line chart. Only three votes, so I don’t know about this one. Chart series formatting – UI overhaul – I think the intent of this one is to provide a single dialog to format all of a chart’s series, the way Excel 2013 introduced one dialog to manipulate chart type and axis for all series. 36 votes, so people, share the love. Go to the User Voice site, read the ideas people have posted, and vote for your favorites. Microsoft is reading these, and commenting on even the ideas without too many votes. I announced the release of Peltier Tech Charts for Excel 3.0, the latest major upgrade to my popular and awesome Excel charting utilities. This major upgrade makes it compatible with Excel 2016, such that one add-in works on both Windows and Mac computers; no need to buy two licenses if you can’t decide on an operating system. Because Mac Excel 2016 is evolving monthly, I have been spending a lot of time making sure that my software takes advantage of the fixes Microsoft makes (and removing workarounds). I have also been addressing a lot of dumb little problems, and I’ve started outlining some new features. The documentation is admittedly pretty lame, so I have started outlining that work as well. If you are a licensee of my earlier utilities, email me and I’ll set you up with a discount coupon so you can upgrade on the cheap. In November, Microsoft hosted the annual Microsoft Global MVP Summit. I met up with a few dozen Excel MVP colleagues, and we got caught up, had a beer or three, and talked Excel with the Excel Product Group at Microsoft. These folks are working on some cool things, not just the Windows and Mac stuff, but also Excel on all kinds of platforms: I let them talk me into installing Excel on my Android phone, and I was amazed that I could actually do a little work on it. They’re working on improved simultaneous co-authoring of documents, and on more new chart types, and this new chart engine they’ve been developing will make charting faster and more flexible. In March 2016 I and several of my Excel MVP colleagues will be traveling to the Southern Hemisphere to present a series of conferences on Excel. We will have two-day sessions in Auckland, Sydney, and Melbourne. Follow the link to read more about Excel Summit South 2016. There will be presentations by the experts, including MVPs, industry leaders, and Microsoft. We’ll have panel discussions and Q&A sessions, and lots of time for off-line chats. On May 26, 2016, MVPs Tony de Jonker and Jan Karel Pieterse will host the third annual Amsterdam Excel Summit. I missed the 2014 session, but I was there last year, presented a couple of sessions, and met a lot of people that I’d only known through email or blogs. I’ll be there again in 2016, so come by and visit; I’m really friendly, not as nerdy as my blog would make you think. On May 27, 2016, I will lead the Excel Charting And Dashboard Masterclass along with Tony de Jonker and David Hoppe. We’ll be teaching about charting, visualization, and dashboards. Microsoft has changed a lot, especially in the past couple of years. They’ve really opened up about what they’re working on, and they’re listening much more closely to what others are telling them. Of course, Microsoft pays a lot of attention to us MVPs, both at the Summit and in the mailing lists they host to discuss things with us. But they also are interested in what their regular users are saying. I mentioned User Voice above, where Microsoft program managers are reading the suggestions that users are posting. They also pay attention to the Send-a-Smile/Frown feedback; I always include my email in the things I send in, and I’ve gotten responses on at least a couple of the items I’ve submitted. This is not the same Microsoft we’ve known all these years. Posted: Monday, December 21st, 2015 under General. Tags: Conferences, Excel 2016, Mac and Windows.